Are you looking to improve your mental and physical health but don’t know where to start? 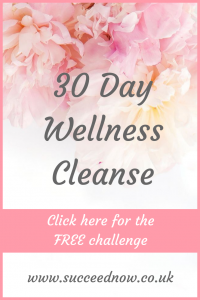 A simple 30 day wellness challenge will get you right on track. At the end of the 30 days you can choose which habits you enjoyed and want to continue with on your journey. These simple habits will take 10 minutes or less every day. I recommend recording your progress through the challenge and noting which ones you enjoyed. Starting your day with a glass of water will help you to wake up feeling refreshed as well as hydrating you ready for the day. Learn something new and expand your mind. Read a blog on something you are interested in and want to learn more about in personal development. Music has the ability to affect our emotions in a positive and negative way. Create a playlist of music that makes you feel happy, confident and motivated. You can then listen to this whenever you need it. Yoga is great for mind-body connection. There are lots of yoga practices for beginners on YouTube that you can try if you haven’t tried yoga before. If you enjoy it search for local yoga classes, this will give you the opportunity to meet other people interested in personal development and make new positive friends. This is a great practice for the end of the day. To reflect on what you are grateful for that day and in your life. There is so much to be grateful for and it is so hard to feel negative when you have an attitude of gratitude. Get yourself a colouring book and some pencils, or even just a piece of paper and spend some time colouring. Without your phone or any distractions, get lost in the moment of creativity. Everyone knows that caffeine is highly addictive and may be a regular part of your day. I personally haven’t had tea, coffee or fizzy drinks since my counsellor suggested this for managing anxiety. I feel so much better for it and I highly recommend it. If you can go one day without caffeine maybe it will show you that you’d rather not have caffeine everyday. Going to sleep listening to a guided meditation is a lovely way to go to sleep. There are so many available on all different topics. They are great for helping you relax and unwind but can also place ideas and thoughts in your subconscious mind. For example wealth abundance meditations for attracting more money into your life. Take a break from social media, delete the apps if you have to. Having a break from social media is a great way to detox and connect with yourself. It’s so easy to get distracted and fall into comparing ourselves with others when we spend so much time on social media. It is proven that being surrounded by nature is amazing for your mental health. It is also a great surrounding to practice mindfulness as you can connect with all the senses around you. Walking as a form of exercise will also release positive hormones into your brain improving your physical and mental health. Get creative and dream about what you want your life to look like. Ask yourself if time and money were no issue what would you be doing? Search for images if you like visuals or imagine it in your mind. You could even write about it if you prefer that method. There are no limits on this one put on there everything that comes to mind and imagine it as reality. Guided meditation is a great way to connect with yourself and be present in the moment. It is a powerful tool for managing stress and anxiety. There are so many guided meditations available on YouTube and many apps – Calm and Insight Timer are my favourites. Reflect on what activities make you feel refreshed and relaxed and make a list of them. You can then use them whenever you need. I recommend at least 10 minutes a day and one evening a week dedicated to self-care to really feel the benefits. This can be anything from having a bath, reading a book, watching a film or going for a walk. Podcasts are a great way to learn new personal development habits and ideas. There are podcasts out there for many topics. Go to the podcast app and search for topics you are interested in to get started. Spend some time imagining your dream future. Put together a collection of pictures of what it would look like. Don’t limit yourself, add anything that comes to mind and create your dream future. This is a great one to continue with if you believe in the law of attraction and want to make this dream future a reality. Spend some time journaling your thoughts in a notebook or on your phone if you prefer. Spending time doing this will free your mind from the thoughts, allowing you to feel free from any anxiety or worries that are in your mind. It is a good idea to write down a lesson from any negative thoughts on your mind. Writing down how you will handle these thoughts next time. Pick an evening to have some quality time alone or with family, without any distractions from your phone and watch your favourite film. Get intentional about the amount of water you are drinking throughout the day. Track how much you are drinking and go for 2 litres today. There are so many benefits to drinking this much water every day. If you feel them then this is a great one to continue. Don’t worry, I’m not about to say to continue this one full time – I believe that everything is okay in moderation. I put this one in because I’m doing this challenge alongside you and I was interested to see if I’d feel any different as I’ve heard it does make a difference. Give it a try today and see how you feel. You don’t have to leave the house or buy any equipment for this one. There are so many workout ideas on Pinterest and YouTube that you can use for free with no equipment or previous experience. Share your chosen workout in the Facebook group so others can try it too. Spend some time reflecting on any goals you’d like to achieve. This can be in your personal life, career, finance, family, friends and socially. From this list you can then decide any that you want to really go for and set a goal in place to work towards. I love this one and this is something I do every single day (with the exception of using it for my meditation app and exercise video on YouTube) I don’t go on social media or open texts, emails or anything for the first hour. Give this one a try and see if it improves your mood and the way you start your day. There are so many foods out there that you’ve probably never tried. It’s a good way to try new things and expand your comfort zone while learning about new healthy foods. You may love it and decide to continue eating it and improve your diet. Spend some time being mindful. This simply means being present in the moment. The easiest ways to do this are walking – go for a walk and be aware of all the surrounds, use your senses and take in all that is around you. And eating – again using your senses while eating. Don’t allow yourself to be distracted by technology or others just be present in the moment and focus on your senses and surroundings. 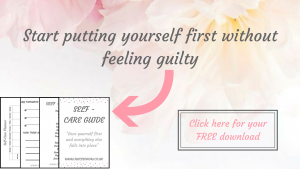 This is a great form of self-care and can help you to feel relaxed. Especially alongside a book or meditation to spend some time looking after yourself. Create a playlist of relaxing music that you enjoy listening to. You can listen to this at times you are feeling stressed and want to relax. You can also listen regularly throughout your day, while driving or doing day to day activities. Go to bed earlier than usual and sleep for longer than you usually would. See how much better you feel in the morning and whether you want to continue with that time for your regular sleep routine. This one is something that I’m really trying to work on. Get fruits and vegetable that you know you like and enjoy eating and make the effort to eat more of them than you usually would. Yay, you’ve completed the 30 day wellness challenge. Now it’s time to reward yourself. Take some time today to spend quality time with family. Without distractions from technology just spend quality time with those that you love. Let me know over in the Facebook community how you found the 30 day wellness challenge, which activities you enjoyed the most and want to continue with on your healthy lifestyle. This is seriously an amazing list. there are so many things on here that I need to do every day that I just don’t do. Pinning this to remember! Whoa, I love Day # 9, I just can’t seem to put my phone down. I always think I have to read my emails and catch up on things. These are amazingggggggg tips! Thanks so much for sharing them, I feel like I always start neglecting myself this time of year, so I really appreciate the reminders. Def going to pin this. I usually start my day with water but I’ve been water lazy lately, like im bored or something! Cutting out chocolate may be tough but I could give it a go once. Im going to list these myself as a to do so I can map my progress! Good idea! Full disclosure, may do something else in place of yoga or just do sun salutes. This post comes in time with the end of the year, when we all need a little time for ourselves to put our thoughts in order and to write down some new year’s resolutions! Great list except for the cutting out chocolate part, those are fighting words for me….LOL but seriously the rest of the list is perfect.